EDWARDS AFB – In the Air Force, there’s a saying: Lead by example. For one squadron commander, he took that saying literally. 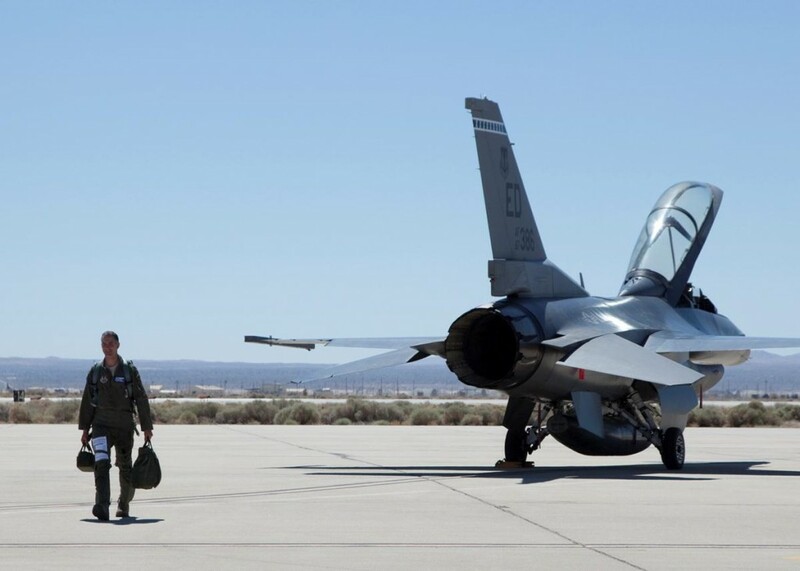 As of January 2013, Lt. Col. Chris Spinelli became the first commander for the 445th Flight Test Squadron to become dual-qualified in the F-16 Fighting Falcon and the KC-135 Stratotanker. According to Spinelli, this unique opportunity arose after he noticed the demand for tanker test pilots within his squadron, especially in light of the on-going F-35 tanker qualification testing. As part of this additional undertaking, Spinelli said he had to undergo some challenging training in order to meet the requirements for the tanker qualification. To get a better understanding of what the training differences are between qualifications in either aircraft, Spinelli said the qualification path for fighter pilots starts with one year of Undergraduate Pilot Training, or UPT, then about three months of Introduction to Fighter Fundamentals, or IFF; followed by Replacement Training Unit for six months in the specific fighter airframe. For tanker pilots, they go through one year of UPT and then immediately move on to the tanker RTU-equivalent or Pilot Initial Qualification, or PIQ, for approximately six months. In Spinelli’s case, he followed the traditional fighter path – UPT, IFF and F-16 RTU. However, unlike other tanker pilots, he did not go through the PIQ program for the tanker airframe. As of now, Spinelli is currently in further upgrade training with his unit to remove that restriction and so he is allowed to fly with other KC-135 pilots who are not IPs. According to him, the IP restriction usually remains in place for most SOC graduates. “I offer a unique perspective having been both on the receiver side, as an F-16 pilot, and now on the tanker side. I obviously still have much to learn about the KC-135 aircraft and the intricacies of the tanker mission. However, I look forward to flying the Mighty War Wagon and being part of the KC-135 legacy,” Spinelli said.